My boy has been sick from yesterday with bad cough and fever. I moved him to our room last night, worried that his fever will going bad. I never had a good night sleep if the kids were sick. I woke up several times to check his temperature last night. Luckily after took some medicines and eat his porridge this morning, the fever went down a lot. He is sleeping right now. The weather is still so hot, 37 degree and will continue during this week according to weather forecast. Only managed to prepare simple snack box for my girl with this small Hello Kitty box. Inside the box : small rice ball decorated with crab stick (red part) and nori, mini tamagoyaki, kumquats, strawberry, fish cracker, and spam with nori. I put more fish crackers in small tupperware container so they will still crunchy for snack time. Hope your boy will be well by then! @tatabonita : Thanks a lot Ta! Hope no more fever tonight or he will end up for blood checking. You must take care too, Lia. Never get tired looking at your beautiful bentos! hope your boy is better now. 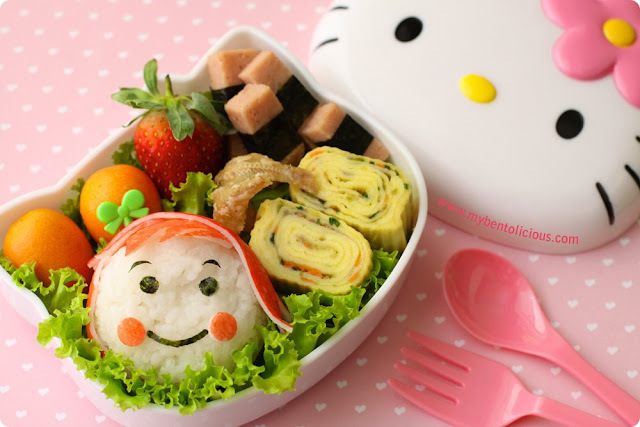 cute bento! Hope your boy gets to feeling better soon and you can catch up on your sleep! i'm so sorry your boy is still under the weather -- you are such a great mom to take the midnight shift checking on him. and your girl will feel loved and special too with this cute snack box! Hope your boy is getting better now. You must be tired because can't well sleep at night, got to take good care of urself too Lia. Poor little one! Hope your son gets well soon. This snack box is adorable and filled with yummy goodness. I hope someday to be able to pack a box as cute as you do! Aww, sorry to hear your boy is sick. I sure hope he's feel better and back to his old self soon! Love the snack bento. I am amazed what you can throw together! The girl is so cute! Now you get some rest! Even when you consider something simple, it always look very sophisticated in my book. :-) I love the Little Red Riding hood and the perfect tamagoyaki. Well done.